President Trump relishes the State of the Union address as an enduring television spectacle, and Tuesday’s edition had plenty in common with high-quality reality TV. There was audience participation, including a spontaneous round of the birthday song for an octogenarian Holocaust survivor (even Mr. Trump was caught by surprise). And there was a celebrity cameo, thanks to the astronaut Buzz Aldrin. 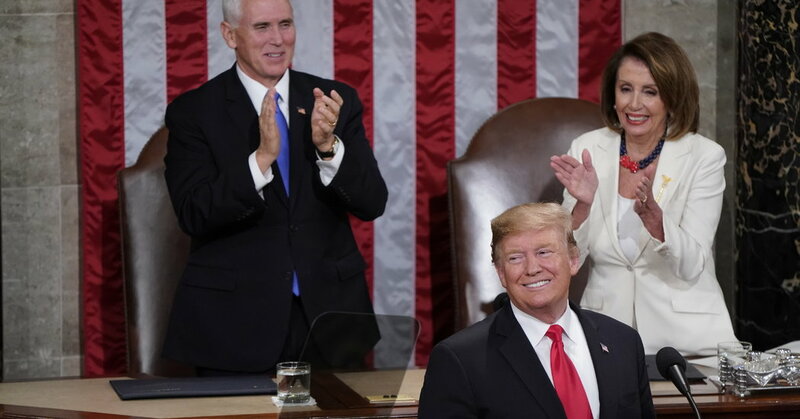 By night’s end, the show had generated a Tumblr’s worth of GIF-able moments — not least the visage of the House speaker, Nancy Pelosi, whose frowns, furrowed brows and occasional smiles functioned as a real-time guide to liberals’ feelings about the speech. Viewers even had a chance to meet the contestants for the upcoming season: The room abounded with prospective 2020 contenders, who seemed highly aware of their place on the prime-time stage. Aides to Senator Kirsten Gillibrand of New York quickly distributed a memorable image of the senator in the chamber, looking skeptical. “She already sent out a tweet raising money on that eyeroll,” the Fox News anchor Bret Baier noted dryly. The postgame analysis fell along the usual lines. On Fox News, the pundit Brit Hume declared that “people may remember this one,” and the host Laura Ingraham called the speech “pretty pragmatic — a lot for people on both sides of the aisle to really love.” Simultaneously, Van Jones of CNN called the speech “psychotically incoherent, with cookies and dog poop,” and on MSNBC, Rachel Maddow expressed horror that Mr. Trump had suggested that the investigations into his administration were hurting efforts at peace. “Deeply uncomfortable,” Ms. Maddow said. As for the star, Mr. Trump offered up apocalyptic warnings about immigrant violence, sending fact checkers into a scramble. “There are certainly a lot of facts to check, which we will be doing over the course of the next several hours, and probably the next several days,” said the CNN host Anderson Cooper. He then noted that the new Congress has a record number of women, drawing another ovation. The lunch was off-the-record, but multiple people in the room described the president’s remarks. At one point, according to one of the people, Mr. Trump warned the anchors not to leak the proceedings.